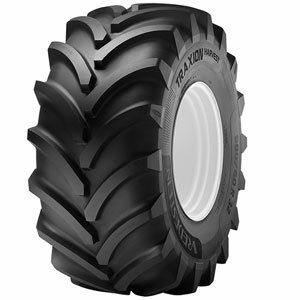 The Vredestein Traxion Harvest is a state-of-the-art radial harvester tyre that incorporates CHO/CFO technology in some sizes. Large contact surface area ensures reduced soil compaction and minimal rutting. Certain sizes incorporate CHO (Cyclic Harvest Operation) technology, making them suitable for high horsepower harvesters. These tyres are designed to meet the specific requirements of harvester manufacturers and are able to operate at lower inflation pressures under load. An angled lug nose deflects sharp stubble. Angled lug ends ensure excellent lateral stability. A straight sidewall design ensures maximised tread width and aids lateral stability.